In general we think that Sony has made no compromise with the quality of sound, Sony MDR-1 rbt guarantees you will never miss a beat. h I am going to need a second before I begin… because I still cannot get the clear and deep bass sound out of my head. Excuse me did I say clear, I meant crystal clear. You probably wonder “what is she talking about?” Well you will find out in a second. If you are a musician or just a music lover you know that every sound, every single tone matters. If you are a musician or just a music lover you know that every sound, every single tone matters. Well you definitely won’t miss even a single one, this is what Sony underlines about the product I am going to show you today. Dear tech fans, we are glad to show you this exceptional pair of headphones just after their official release. This is Sony MDR-1 rbt. When we first saw the headphones during the IFA in Berlin a month ago they impressed us with their exceptionally sleek and beautiful design that comes in a fancy black box. But the picture became complete the moment we took them for a test. Of course it’s not only about the looks, their design in combination with the materials used guarantees incredible sound experience. The lightweight metal and leather used makes the headphones a perfect sound barrier for outside noise. Their perfectly designed ear cushions and weight of only 297gr provide long-term wearing comfort. Their perfectly designed ear cushions and weight of only 297gr provide long-term wearing comfort. Now you can enjoy your favorite tracks without being tied to your music player or computer. Equipped with Bluetooth v 3.0 and the NFC (Near Field Communication) technology you can enjoy up to 30 hours of music with one full battery charge. In case you need it you can also find a connection cable for the headphones included in the package. Now let’s find out what is it that makes the sound from these headphones so unique. There is 40mm liquid crystal polymer film diaphragm that provides supreme sound clarity. How supreme, well, the high-definition driver assured ultra-wideband audio performance that extends from 4 Hz to 80kHz. When it comes to flexibility of use this pair of headphones earned 5 out of 5 points during the test period. How supreme, well, the high-definition driver assured ultra-wideband audio performance that extends from 4 Hz to 80kHz. It has probably happened to you, you are in a rush or stuck in the subway on your way to work and you kind off want to skip that song… well, we have good news for you, you don’t even need to get the player out of your pocket. 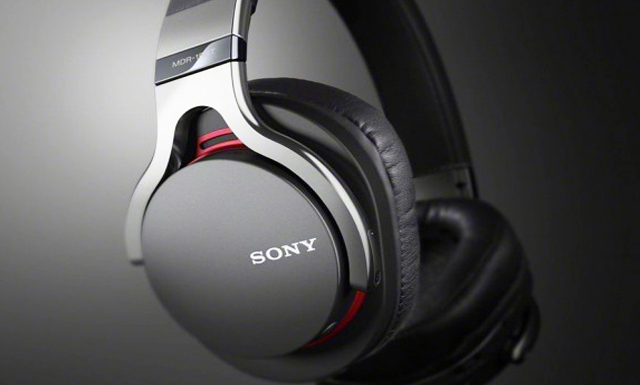 On the MDR-1 rbt Sony have featured a play, forward and backward switch as well as a power button on the headphone itself for your ultimate comfort.